It's time to feel this way more consistently! 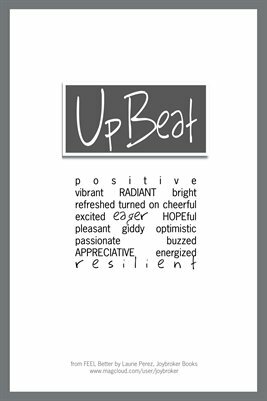 UpBeat: Positive - Radiant - Refreshed - Turned On - Resilient - Passionate - Energized. Clear: Appreciative - Focused - Creative - Worthy. From "FEEL Better" - available on MagCloud in Joybroker Books.